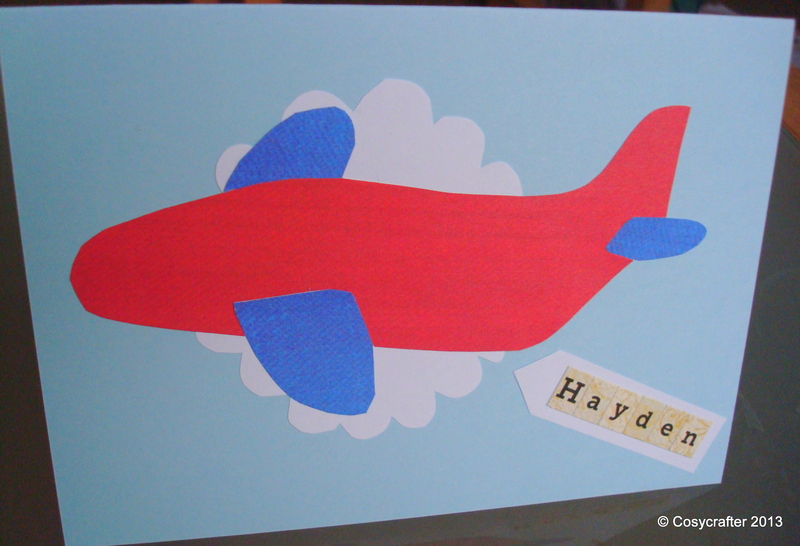 It was my nephew’s 2nd birthday and he adores planes, so I knocked up a quick plane card for him. First, I drew a rough plane shape onto some paper for a template, and then used some paper that I got ages ago with Simply Homemade magazine, in red and blue, and cut around it. Next, I cut an extremely rough cloud shape out of some plain paper, and glued both that and the plane to one of the blue Hobbycraft cards. Finally, I made a little tag out of plain paper, and used the BasicGrey: Serenade Alpha stickers to spell out his name. And it was as simple as that (a relief after last week’s hideous eye mask fail). Obviously, my nephew much preferred the actual toy plane we’d bought him, but I thought this card was a nice accompaniment. Posted in Cards and tagged birthday, boy, card, child, craft, handmade, paper, plane. Bookmark the permalink.